I was rescued from an abusive home just days before I gave birth to 6 kittens. I arrived at my foster home with my six 3-day-old kittens and I then took on 2 more kittens who had been abandoned. I was a fantastic mother to these eight kittens. I am just over a year old. I am a VERY sweet gal. I love to cuddle. I talk to get your attention - I just love to be the center of attention now that my babies are on their own. Please call my foster mom so you can meet such a precious lady; her number is (828) 778-3011. Please pass this on and help Avon find a forever home! What a cutie! We're purring you find a fantastic forever home. It hurts me very much to learn that a feline was abused, especially since she was pregnant. Unfortunately he won't be the last. Thank you for stopping by my blog and adding it to your roster, including being the first to follow me on Twitter. Now daddy won't have an excuse not to start twittering. We have reciprocated your kindness and daddy will also list your site on The DIRECTORY, one of daddy's blogs. Avon, after being such a great mom, it should be your turn to get adopted! Hope Avon find a loving forever home soon. Thank you for you kind comments on today's blog...dag gone the 4 pictures with all the information on them did not post. Blogger is great when it works HA! Avon is a lovely girl - we hope she gets a loving home soon with lots of love and affection. Avon is a beautiful girl. 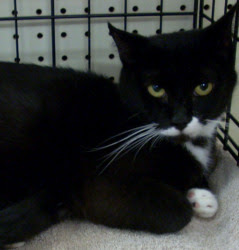 We are so happy that she was rescued from a bad situation - and we're purring for her to find a wonderful forever home. Hi Avon, we sure wish we had room for you here but our Inn is overflowing. You sure are a cutie and we hope with all our hearts that you find a super home. I so very much look forward to seeing a post about Avon getting adopted! I can see she would be a great cat for the right people. Give us a post or many posts about the adoptions of the eight kittens - that would be interesting. I bet it was not hard to find forever homes for them since they were probably totally adorable. For those reading this, please visit my blog about a colony of abandoned/feral cats near my home. There will be stories there as time goes on that could inspire and inform anyone you know who is helping or plans to help homeless cats anywhere. We are purring and praying that Avon can find a good forever home soon - she is such a cutie! We will keep our fingers and paws crossed! Avon is a little cutie! We purr she will have a safe forever home soon. Avon is so very pretty! I like to talk too! I meows and meows lots! Oh, Avon, you sure do deserve a good home! What a giving mama you are! We've put you up on our blog, too! You are an inspiration honey and we're purring for you! Happy Mo' Cats Day !